Come see me on Free Comic Book Day! 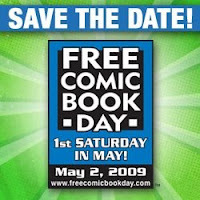 For those who don't already know, May 2nd is Free Comic Book Day. You can go to a participating comics store in your area to get some 100% free comic books to enjoy. I especially hope that parents will take their kids to avail themselves of this event, as we can never have enough kids reading, and reading comics. There's a shop locator search box on the FCBD site for your convenience, so check it out! But if you're in the SE Michigan area, I hope you'll stop by Green Brain Comics, where my Art & Story compatriot Mark Rudolph and I will be signing books and giving away free comics of our own! Both Mark and I will also be doing some live podcasting from the event, so besides getting a chance to nerd out over visual storytelling with us, you can be a part of our show.